Ski racing is an expensive sport. There’s no way around it. Families that have put their kids through “the system” have sacrificed immensely to help pave – and certainly pay for – this path. A clear definition on the return on this investment is the million dollar question that ski racing families grapple with. I have opined often in this space about this struggle and the complexity of understanding the payback of such a massive financial commitment. Of every 100 ski racers only one or two progress to the World Cup; so what happens with the other 98 percent? It was on a recent media trip to Utah where the answer (or at least part of it) to this age-old dilemma struck me: The ability to be an elite skier on the mountain. Any mountain. For the rest of your skiing days. During this trek to the heart of the Wasatch mountains that surround Salt Lake City; first to the big (and I mean BIG) peaks at Alta and Snowbird, then to the super-fun frontside slopes and groomers of Park City and Deer Valley, I was reminded again that the technique that was drilled into us at a young age did not end at “retirement”. Far from it. Alongside Ski TV host Claire Challen, legendary photographer Paul Morrison and longtime Ski TV videographer Darryl “LG” Palmer, we navigated through the vast terrain, exploring nearly every nook and cranny, to collect the materials for what will be a quality feature story in S-Magazine and two Ski TV episodes (airing in February) that will showcase the impressive offerings that surround “SKI City” – Salt Lake’s marketing push that highlight the close connection to 10 resorts all within a 45-minute drive to Utah’s capital city. We were hosted by resort ambassadors and staffers (all genuinely nice people and good skiers) and we pushed hard to not only challenge ourselves to properly paint the right picture of Utah skiing, but also to conquer the terrain … the right way. Claire was carving and ripping every bit of that terrain, from the steep and challenging pillowy chutes of Snowbird to the corduroy groomers on “Stein’s” run at Deer Valley (the late Stein Eriksen’s favourite run). When you see the show you’ll see me trying to keep up and loving every minute of it. Likely the most valuable being the life lessons of managing your own affairs, of accountability to your team and yourself, of the concept that hard work leads to success. These attributes are easy to write … extremely painful to learn. But the results of this bumpy road lead to a lifetime full of engrained ambitions that drive success. Back to the point. Ski racing’s big ROI comes in many shapes and forms. Likely the most valuable being the life lessons of managing your own affairs, of accountability to your team and yourself, of the concept that hard work leads to success. These attributes are easy to write … extremely painful to learn. But the results of this bumpy road lead to a lifetime full of engrained ambitions that drive success. Ask any former ski racer. Or ask yourself: How do you have this undeniable drive to succeed? And has this been a benefit in your personal and business life? Of course it has. 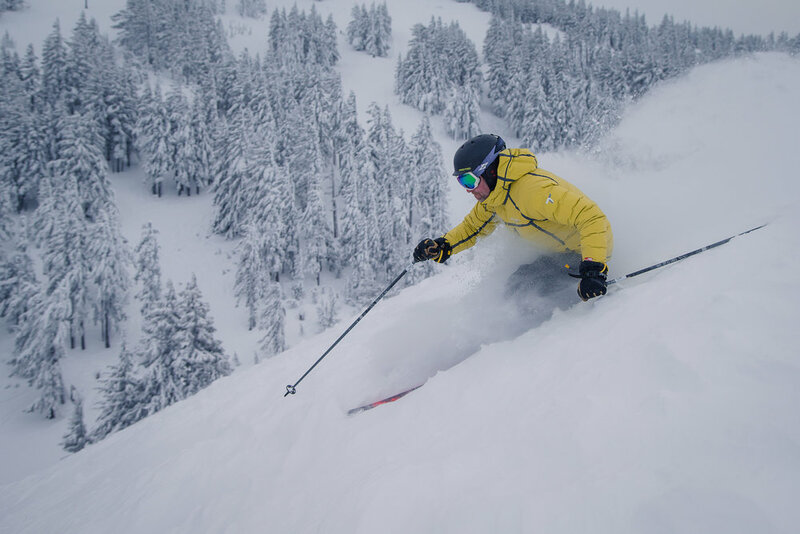 Besides those vitally important life lessons, the point of this blog is to highlight this value of learning proper ski technique – which I argue can only be properly mastered through the ski racing system – will set you up in the ultimate family sport … for life. The ski racing path is not what it used to be. Back in “the day” you either progressed to the next level or retired. Now the pathway options are vast and many times prosperous. Just look at Stan Rey, who is crushing the freeride world after a successful stint in ski cross, where he earned Canadian and Nor-Am titles. Previous to this, Rey was a member of the BC Ski Team and the Whistler Mountain Ski Club. There are hundreds of other success stories like this. But perhaps the biggest and most rewarding benefit to the ski racing system is the foundation in a life-long sport. There is no other sport, IMO, that epitomizes family togetherness like skiing. It is a generational glue that ties us together. And those families that have invested in the ski racing path will not only reap the rewards of self-determination and work ethic, they will also be the first to bottom, by a Utah mile. Older PostBOWLES’ BLOG: VONN VS STENMARK … THE RACE IS BACK ON!